Uncategories Projection updates for June 2nd: The PC rebound confirmed? There was a time during this campaign, about the end of last week, were people genuinely wondered if we were witnessing an orange wave in Ontario. This reached a peak when Pollara published a poll putting the party of Andrea Horwath at 43%, 11 points ahead of the Conservatives of Doug Ford. At that time, my projections were literally showing a 50-50 race. Since then, however, things have changed slightly against the NDP. The NDP didn't really drop in the average, but it stopped increasing and seems to have got stuck around 36-37%. The PC on the other hand enjoyed a small rebound. A rebound somewhat confirmed by looking at the recent trend in the Mainstreet tracker or the most recent polls from Ekos and Forum. At the very least you can say the PC managed to stop its fall. [Small update] Mainstreet released the new riding poll in Guelph and it confirmed Mike Schreiner ahead. So my next projections will have the Green leader as favourite there, although it remains a close race. Here below the updated projections. It is still a mix of projections and the numbers from the poll. A couple of remarks about my model and my poll aggregation. I don't waste my time trying to weigh polls based on whether they were done 24 hours earlier or if they have an extra 200 respondents. I mostly use the polls over the last week and give everyone the same weight. You can think I'm lazy but my polling average has been better than the CBC one for multiple elections. I have published research showing that these factors don't matter significantly regarding polling accuracy. What I do differently is regarding undecided. Pollsters usually allocate them proportionally. So if one party is at 40% among decided voters, they assume this party would get 40% of the undecided. This means they are making a very implicit assumption: undecided will ultimately break out the same way as decided voters. My point is: then why were they undecided in the first place? Alternatively, the proportional method is equivalent to dropping all the undecided and assuming none of them will vote. I dislike both assumptions and find them unrealistic. Instead I allocate the undecided non-proportionally among the top parties (Liberals, PC and NDP). The small parties don't get undecided. This allows me to take care of the usual overestimation of small parties. Additionally, I allocate proportionally more undecided to the incumbent. Why? Well because a careful look at polls over the last years showed that the incumbent was systematically underestimated. Also, I can justify this by saying that undecided voters will be more likely to go with the safe option, the one they already know. 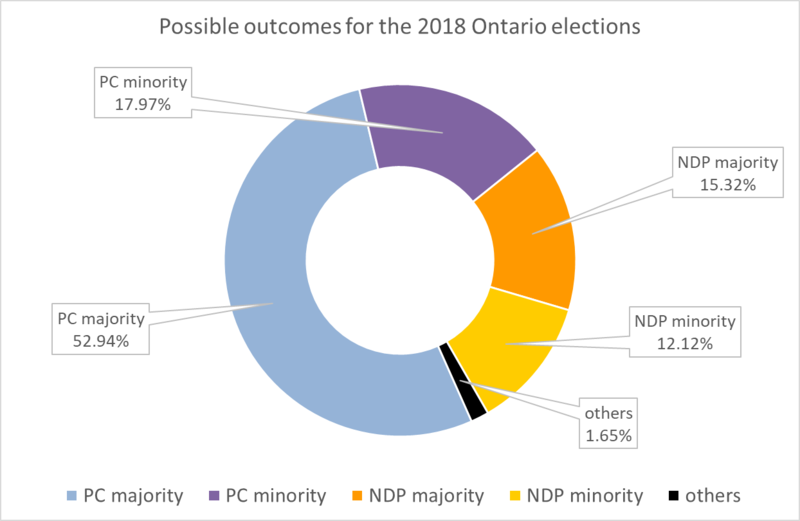 In the case of the Ontario election, I started the election by giving 40% of the undecided to the Liberals (instead of the 25-30% they would get with the proportional method), 40% to the PC and 20% to the NDP. But since the NDP has now taken the lead, I changed to 1/3 for everyone. It boosts the OLP a little bit and decrease the Green. It mostly leaves the NDP and PC where they'd be. Yes my 1/3 rule is arbitrary but you have to make an assumption at some point. I find mine no more stupid than going with a proportional allocation. On top of this, as I was explaining the other day, the riding polls from Mainstreet simply do not line up with the province wide ones. And the difference is still present in the last few days. So after spending way too much time looking into them, I dropped the adjustments made based on the riding polls. 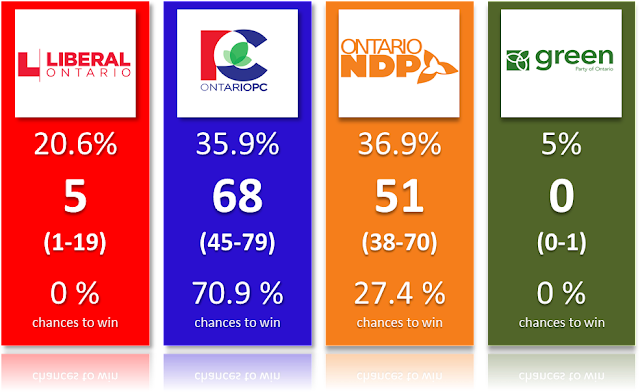 I believe the riding polls are biased towards the PC and against the NDP (compared to the province wide polls that I trust more) and using their information is therefore introducing this bias into my projections. It's possible these polls are right but if they are, then the provincial average will be way, way off. I kept 4 riding polls. Three in the North (Sudbury, Sault Ste. Marie and Kenora-Rainy River), a region traditionally very volatile (and in the case of Sault Ste. Marie, the poll confirmed that the by-election results should most likely be used as baseline). I also kept the one in Guelph because it was the only way to measure the Mike Schreiner effect. Mainstreet will re-poll there and publish tomorrow, so we'll see if the Green really have a shot. All the other ridings polls have been discarded. Let's focus on the chances of winning instead than on the seat total. We basically have a 70-30 race. Anecdotally, this is similar to the state of the race at the end of the 2016 US election. Don't interpret this as me saying you should expect a surprise NDP victory! With that said, there are similarities in the sense that it looks like there are very few paths for the NDP to win. The NDP vote being less efficient (in being converted in seats) than the PC vote, mostly because of the 905, it means the NDP either needs to hope for a severe underestimation in the polls (could be caused by a good turnout of the NDP voters) or a massive change to the electoral map. One path that would allow Horwath to become Premier would be a NDP surge in the core urban ridings of Toronto and Ottawa. This could be accomplish by a massive transfer of OLP voters to the NDP (strategic voting anyone?). 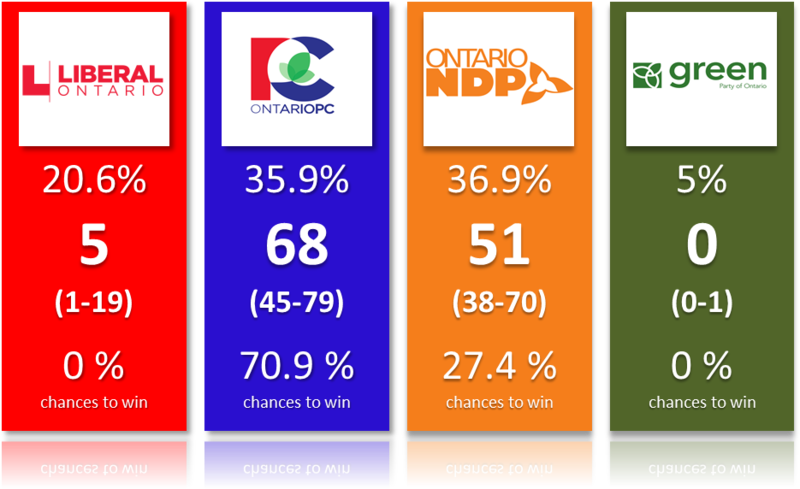 If nothing changes in the last few days, we'll have an election night where Doug Ford will be favourite but a NDP win shouldn't be considered as super unlikely or shocking. Well, that's assuming you believe my probabilities and not the CBC's ones since the CBC is currently only giving the NDP 9.1% chances of winning. I already explained why I think this is plain wrong. This is either seriously underestimating how wrong polls have been in the past or overestimating how good the model is. Many think that for Ford, it's majority or burst. They might have a point. First of all, winning only a minority for the PC would be barely above blowing a 4-1 lead. After all, let's remember that the PC started this campaign with a very comfortable lead. I'm sure many would criticize Ford for dropping the majority. Also, if Ford fails to get a majority, we can't exclude the NDP and Liberals making some sort of deal. Anyway, if you are in the camp that thinks it's majority or burst, then you should know that the chances for such a majority are only 52.9%. So a toss-up basically. Speaking of majority, the collapse of the Liberals means a minority is not the most likely outcome. It's simply arithmetic really. For a minority to happen, you need a third party winning enough seats. That's not currently the case for the Liberals, although the confidence intervals shows that if the Liberal vote was to hold better than expected, then this party could win significantly more than 5 seats. What are the best and absolute worst case scenarios for each party? For the PC: 22 seats is the worst, 93 is the absolute best (think of this scenario as the one where the Tories were underestimated by the polls and its vote was incredibly efficient). Green: 0-1 (Note on Mike Schreiner: it's always hard to measure a local effect such as what might be happening in Guelph. The conditions look good for the Green leader -no incumbent, a split vote meaning the threshold to win the seat is low, etc- but I can't just go ahead and boost Schreiner. If the Mainstreet poll today confirms he's ahead (like in the first poll), then I'll make adjustments. For now, my take is that this is a 4-way race and he has some good chances. As you can see, the only certainty seems to be that the Liberals will finish 3rd. Notice that the projections above don't fall exactly in the middle of each distribution. The PC is currently projected slightly on the higher end of its interval while the OLP is in the low tail. This mostly comes down to close races and the PC is currently winning a majority of those. 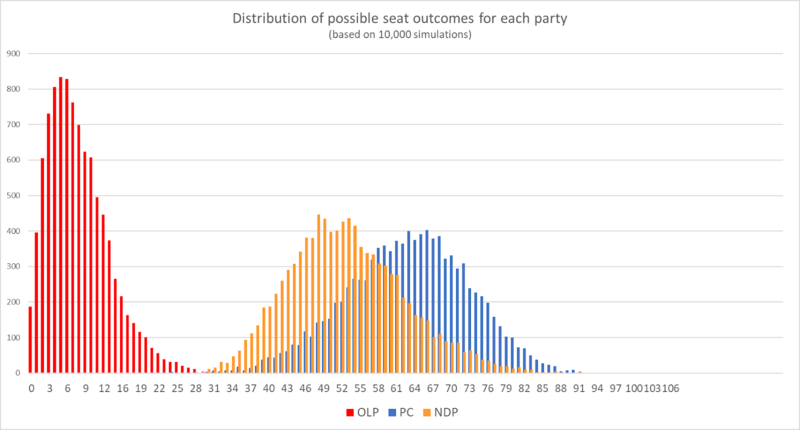 Still, if you instead prefer the average scenario as projections, then it's OLP 7, PC 63 and NDP 52. That should convince you that a majority for Ford is far from guaranteed at this point. In conclusion, this will probably remain a close race until the end. I'm starting to be of the opinion that the real uncertainty will be whether Ford gets a majority though (because of how difficult the 905 is for the NDP; Elections in this country have often been won in the suburbs in recent years and I feel the suburbs have decided to change Wynne for Ford). I know that many things can happen during the last few days, but I feel that if there was supposed to be an orange wave, it would have happened by now. There is something preventing the NDP from reaching the 40% mark, or at the very least from taking a commanding lead over the PC. I'm not sure what it is exactly (fear of the Rae days? etc) but I don't expect a late surge for this party. That's just my reading of the race and I'm usually wrong, so take it with a big grain of salt. Finally, the riding by riding projections. Remember that you can make your own using the simulator. 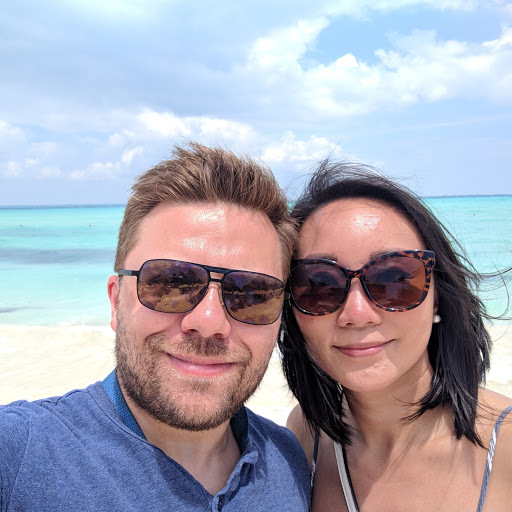 Last day of the campaign! What could a NDP victory look like? Is the NDP vote really that inefficient?